Summer’s days may be fading fast but that doesn’t mean there’s any shortage of things to see at the water’s edge in Tofino and Ucluelet. From September 15th to the 25th, the Island’s west coast is home to the Carving On The Edge Festival. Wood carving is an artistic tradition with deep roots on Vancouver Island. For 10 days, both traditional and contemporary wood carvers will be celebrated through a series of fine art wood carving shows, traditional canoe-building demonstrations and workshops, tool-making & design workshops, storytelling events and hands-on wood carving events. Perhaps of particular interest is the 10-day-long workshop with acclaimed canoe builders Joe Martin and Carl Martin. 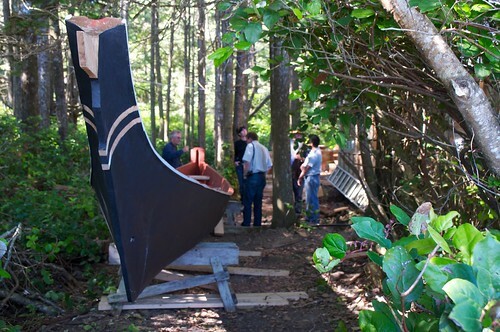 The building of a traditional sea-faring dugout canoe will be the highlight of this workshop. All events during Carving On The Edge are free and open to the public at various locations throughout Ucluelet and Tofino. You can pick up a “Carving Map” at any number of local retailers. The festival is proudly presented by the Pacific Rim Arts Society and sponsored by a number of fantastic area businesses. For more information and a full line-up of events, please visit Carving On The Edge Festival online. There you’ll also fine more information about the various artists participating in the festival.